SEOUL (Yonhap) — South Korea’s National Assembly approved the country’s bilateral free trade agreement (FTA) with China during a main session Monday. 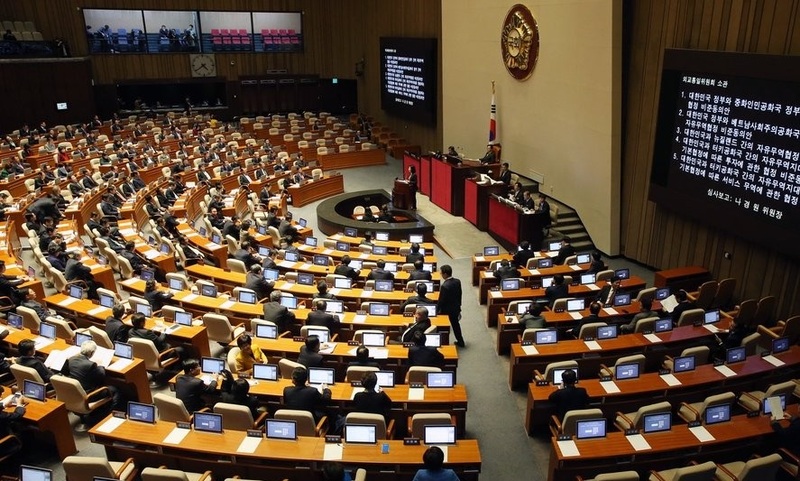 Lawmakers of the ruling Saenuri Party and the main opposition New Politics Alliance for Democracy (NPAD) put the accord to a vote after days of intense discussions, and it passed in a 196-33 vote with 36 abstentions. The agreement still needs China’s ratification in order to take effect as early as this year. “(The Korea-China FTA) will act as a new stimulus and a growth engine for our future economy with the increase of the country’s gross domestic product (GDP) by 0.96 percent in the next 10 years after it takes effect,” the Seoul government said in a ratification bill. The two countries officially inked the deal on June 1, taking a step closer to implementing what officials here call a mutually beneficial and significant trade pact. China is already, by far, the world’s single largest importer of South Korean goods. Trade volume between South Korea and China stood at US$290.5 billion in 2014, 22 years after they established diplomatic relations in 1992, according to Chinese data. The trade pact has been in political limbo in the National Assembly for days as the NPAD maintained that it is necessary to take supplementary measures to support industries that will suffer from the agreement, such as the agricultural sector. In an attempt to break the deadlock, floor leaders of the rival parties met and came up with a measure to support agriculture and fishery industries. Under the measure, the government will provide approximately 1 trillion won (US$865 million) in direct financial support for farmers and fishermen to minimize damage from the new FTA with China. Nearly 100 billion won will be financed from government and public enterprises over the next 10 years, according to the measure. Immediately following its implementation, the Korea-China FTA will expand South Korea’s trade territory, represented by the combined GDPs of countries with which South Korea has an FTA, from the current 61 percent to 73 percent of the global GDP. It is also expected to boost the countries’ annual bilateral trade to more than US$300 billion, a 39.5 percent hike from $215.1 billion in 2012, Seoul’s trade ministry said. In the 10 years following its implementation, the free trade deal is expected to boost South Korea’s real GDP by 0.96 percent while creating some 53,800 new jobs. Under the Korea-China FTA, Seoul will eliminate its import tariffs on 79 percent of all products, or 9,690 goods, from China within 10 years following its implementation. Beijing will do the same on 71 percent of all products, or 5,846 items, from South Korea over the cited period. In the 20 years after the FTA goes into effect, South Korea will have eliminated its tariffs on 92 percent of all products from China, with China eliminating its tariffs on 91 percent of all products from South Korea. In the same session Monday, the National Assembly also approved bilateral FTAs with New Zealand and Vietnam. Under the Korea-Vietnam FTA signed in May, the Southeast Asian country will completely remove its import duties on 89.9 percent of all products from South Korea over a 15-year period following its implementation. Seoul will do the same on 95.4 percent or 11,668 out of the total 12,232 products imported from Vietnam. Under the FTA with New Zealand inked in late March, South Korea will remove tariffs on 96.4 percent of all products from New Zealand within 15 years of the deal taking effect. By comparison, New Zealand will eliminate tariffs on all South Korean goods within seven years of the deal taking effect. The two sides agreed to exclude rice, a key staple food for Koreans, and other sensitive agricultural produce, including apples and garlic, from the deal. The National Assembly also passed an FTA in the investment and service sectors with Turkey that will complement the bilateral trade pact that went into effect in 2013. The countries implemented their bilateral FTA for products in May 2013 after they failed to narrow differences in the service and investment sectors. The agreement for the service and investment sectors will open up most of Turkey’s service market with only a handful of areas excluded from market liberalization, such as government procurement and airline services. It will also prohibit any type of restrictions on market access while also requiring both countries to streamline their regulations with international norms.